New devices 8 × 1:3 Digital Video Presentation Switcher, available through Avit Vision, combined switching, scaling and transport distance and AMX control technology with world brands of audio and video integrated into a unique and compact system of Administration AV. 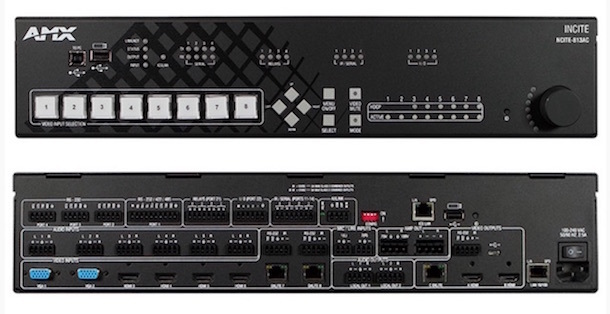 Professional platform AMX by Harman video safe 4K 60 solutions 4:4:4 has been expanded with the range Incite 8 × 1:3 Digital Video Presentation Switcher, composed by models Incite-813, 813A and 813AC, designed for application in classrooms and meeting spaces and in which the company concentrates the best technology of well-known global brands of audio, video and control integrated in a single, compact device. 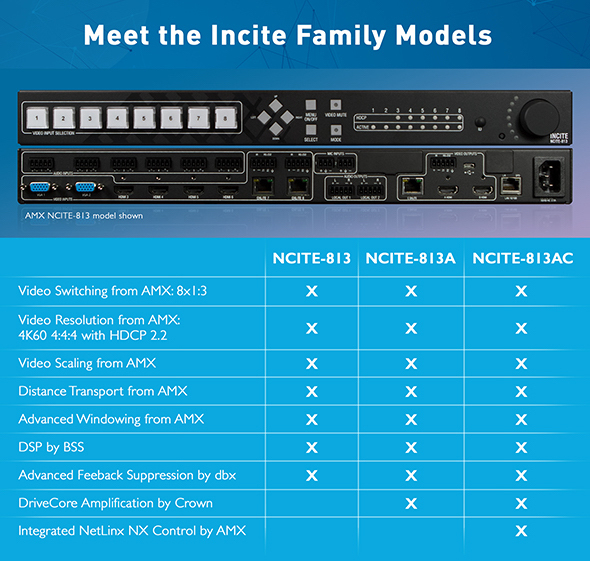 Available through Avit Vision, range Incite 8 × 1:3 Digital Video Presentation Switcher combines switching, scaling, transportation distance and AMX control with digital signal processing BSS; Advanced Feedback Suppression of dbx and DriveCore amplification of Crownall in order to offer an optimal digital presentation switching solution. Presentation of digital video of AMX Incite features include 'windowing' advanced scaling for various settings video (side to side, up and down and picture-in-picture) and functions of production style of live video, as effects of transition. To this is added support and scaled 4K/60 4:4:4 and HDCP 2.2, as well as for lower resolutions; features which allow the range Incite offer flexibility to guest devices and compatibility from source, so if inherited as new devices are used. Audio features include DSP capabilities advanced, parametric EQ of ten independent bands, independent of gain entry and variable compression settings, Advanced Feedback Suppression and two of the three models also include technology DriveCore amplification.